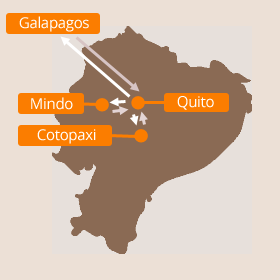 Although we're keen for people to learn about the amazing sights on the mainland of Ecuador, obviously the big draw for many people is the Galapagos Islands. This holiday shows how you can combine the two and get the best of both worlds! You will arrive in Quito today as your Ecuador holiday begins. We’ll be there to pick you up and take you to your hotel, which is in the heart of the capital. You will probably want some time to rest and get used to the altitude so we have left the rest of the day free for you to relax. Your hotel is close to dozens of restaurants and cafes, as well as all the other facilities you'd expect from a capital city, so if you're feeling up to it then why not head on out and explore one of South America’s most beautiful capitals. Our standard hacienda for tonight is the lovely 300-year-old Hacienda La Cienega, but we work with several different haciendas in Cotopaxi, so just let us know if you'd like to see some other options. This itinerary is based on a five-day island-hopping holiday in the Galapagos, but we can easily change this to be a longer land-based itineray or a cruise in the Galapagos islands if you prefer. The Saturday market in the small town of Otavalo is not only the largest in Ecuador, but is one of the largest traditional markets anywhere in South America. You can always visit it on one of the regular day trips from Quito, but this 2-day private excursion is a much better way of doing things. We will pick you up in Quito on the Friday and drive north to Otavalo, visiting the glorious Cotacachi valley and the lovely Lake Cuicocha along the way. This means that the next morning you can have a bit of a lie-in and still be at the market before the crowds from Quito, and then we can drive you back to the capital in the afternoon, stopping off at the Middle of the World complex on the line of the Equator as well. Our standard price for this Ecuador and Galapagos holiday is £3250 per person, which is based on two sharing a double or twin room in our standard hotels and lodgse. That price includes all your accommodation, internal transport, transfers, tours, guides and entrance fees, plus all your meals in the Cloud Forest and Galapagos Islands, lunch in Cotopaxi, and breakfast every day.